Just a real quick review to keep my backlog from getting too long. Not much to say about this beer anyways, it is a pale ale in a tall can. The nose started promisingly with a pronounced whiff of pine, cedar and bitter oranges. Sadly once this pleasant aroma dissipated there was a noticeable aroma of diacetyl. This was confirmed by the slick mouthfeel that was best described as medium to full. Building on the citrus, pine thing was the usual honey and biscuit malts. 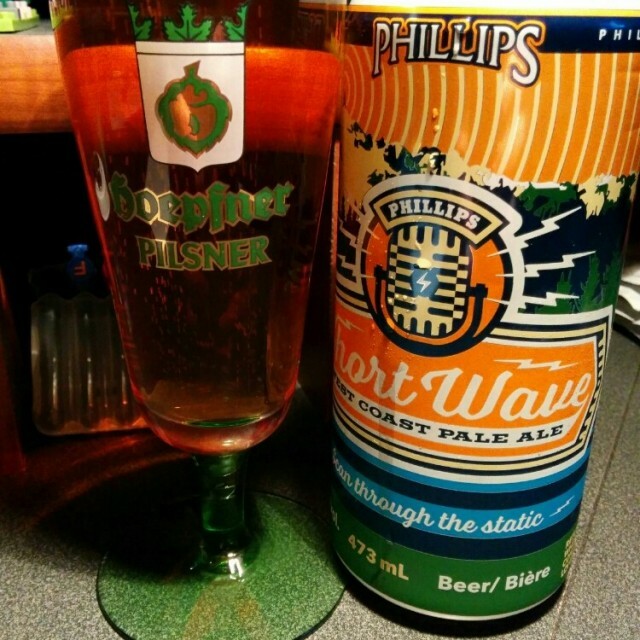 The Shortwave is a oddly sweet beer despite the initial hop bitter aroma. Overall, the best thing in a can for under 2 bucks. I think the description is aggressively popular. Glassware: Right from the can is fine. Food Pairings: Would go with anything, honest. 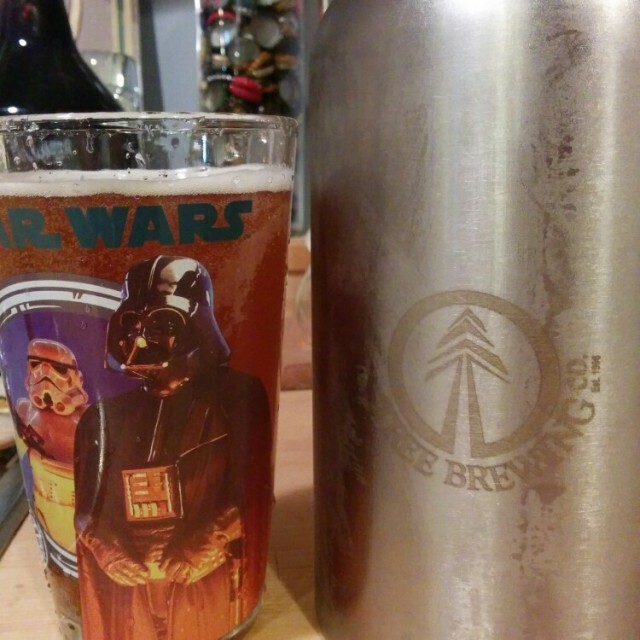 I was asked by a friend for my thoughts on the 2015 Canadian Brewing Awards. Let us break down the medals to prove that BC is the best place in Canada to drink craftbeer. Perhaps the perfect place start is with the brewery of the year, Four Winds Brewing in Delta. This brewery just celebrated it's second birthday with a very prestigious present. At this years CBA, they took home 5 medals from 14 entries (thank you Brent). This is a 36% success rate; most of my analysis of the CBA will feature this measurement. In turns of medal breakdown, BC breweries cleaned up. Of the possible 123 brewing medals, BC took home 45, Ontario 41 and Quebec racked up 23. As a percentage it reads BC 37%, Ontario 33% and Quebec 18%. Macro breweries are allowed to enter this contest. As a side note, macro breweries took home 11 medals or 9% of the total. I'm not sure who is and who is not considered a macro back east, so this is an estimate. Macros only scored higher than a craft brewery in 5 categories. Most of these were the ones you would expect: lagers, wheat ales, light lagers and cream ales. In comparison, Victoria breweries fared almost as well as the macros with 9 medals or 7%. In fact, Victoria received 23% of the medals won by BC breweries. BC breweries also swept two entire categories: Black IPA and Red/Amber ales. Ontario also swept two: Wood/Barrel aged and Honey/Maple beers. This seems about right, we like our hoppy beers but do not get a lot of maple syrup on this coast. 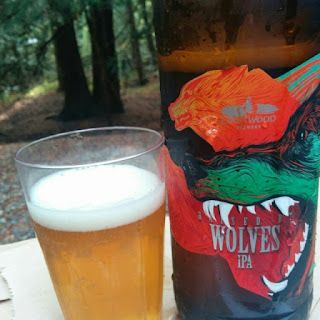 At this point the comparisons between BC and Ontario breweries might seem pretty close. These next numbers pull BC to the front of the line. Of the 1097 total entries, BC submitted 336 and Ontario 408. While Ontario did enter more beers, BC had a higher percentage of winners based on entries. BC claimed medals 13.4% of the time, while Ontario only took the podium 10% of the time. To make BC appear more awesome, lets look at this based on our provinces population. In January 2014, BC had a population of 4.61 million and Ontario 13.6 million. This means that BC had a medal ratio of just under 1:100,000, while Ontario trailed far behind with 0.3:100,000. More great beer per capita! We will just ignore the fact the Ontario took home 15 golds and BC only 12. 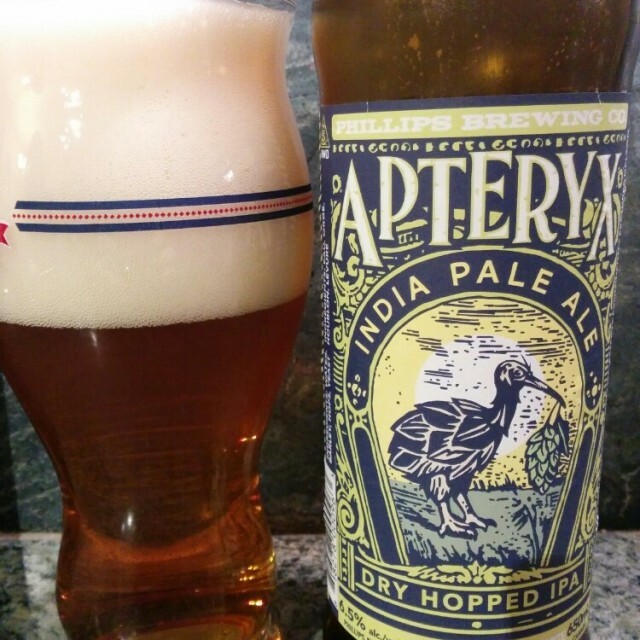 But BC did take claim the best IPA, which is the only category anyone cares about. Well done Russell Brewing. Apparently Mike really liked the Punch Bowl. Now for some of the highlights and fails of the CBA 2015. For highlights, many new BC breweries took home medals. Category 12 in Victoria took home gold in the BIPA category. Bad Tattoo in Penticton took home two silvers. Rossland Beer Company's 7 summit milk stout out classed last years beer of the year, the Sasquatch stout from Old Yale. As for the fails, they all happened back east. Amsterdam Brewing entered the most beers, 29 in total. They only took home 2 medals. Mill Street entered 26 beers and took home nothing. Ouch. Even Canoe Club beat them and won a medal in the pilsner category. Something I found interesting was that BC's favourite brewery, Driftwood, did not place a single entry. 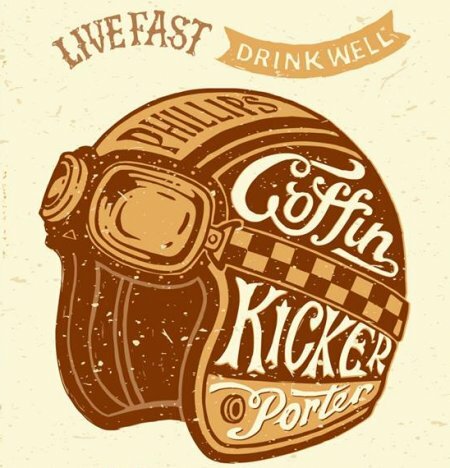 Also one of the largest brewery in BC, Phillips, only entered their top selling four beers. Too bad, Blue Buck Pale Ale did very well in the 2012 lager category. If you have any highlights or thoughts about this years CBA, leave a comment below. Or you can leave a comment if you think my math is wrong. Two things to mention in the post. The first is rather shocking. As everyone knows, last weekend was the Canadian Brewing Awards and BC Breweries cleaned up. Beer Me BC has a nice write up on his blog. 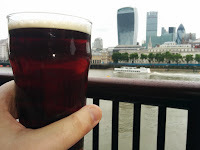 What was shocking was that the most notable BC Brewery not to enter any beers was Driftwood. Nope, not a single entry. I wonder if they did not enter in 2014 either? Phillips just sent in their four best sellers. Too bad, apparently Blue Buck Pale Ale was a silver metal winner in the lager category in 2012. The second item to mention was the inability to satisfy of my pompous palate. This is neither new nor exciting. Like a good Victoria beer drinker, I rushed out to buy the 2015 Driftwood sour release. Money was blindly placed on the counter and this coveted bottle was rushed home to chill. The idea temperature was reached and the favourite glass was used. After being thoroughly cleaned of course, lest I be scorned by a certain penny farthing rider. I sipped, I tasted, I tasted again and I was saddened. Don't get me wrong, this beer was delicious. I was just not stupefied. 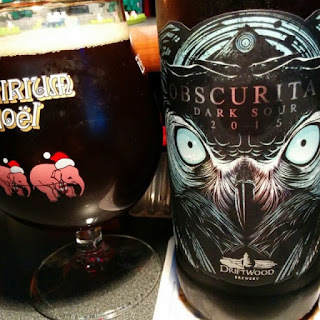 When the first Driftwood sour came out, I was blown away. The flavours were so unlike those the Victoria craft beer drinkers have every tasted. This years sour tastes very similar to last years. Perhaps the desire to search out new flavours and fermented imbibing experiences has cost me the ability to just enjoy a beer. The contents of my recycling bin has been looking rather empty lately. Is this why big breweries never market, or listen, to beer geeks/snobs? We, or maybe just I, never drink the same beer twice and whine whenever I do. This seems like a good time to shut my mouth, figuratively, and review this beer. 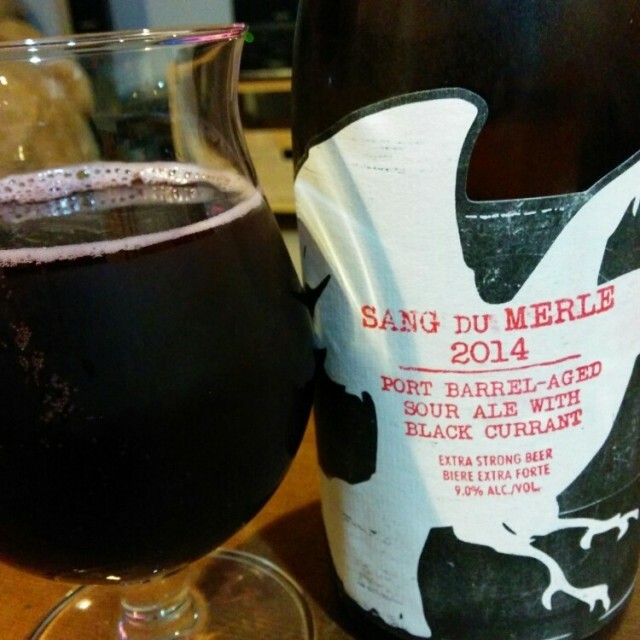 This beer hits all the marks that a good sour should. The nose is a ponderous mix of sweet and sour. Dark candy sugar and balsamic raspberry vinaigrette are the dominating aromas. Your teeth grind from the gripping acidity and your tongue screams from the sourness. It is hard to sort out the flavours, sour bing cherries, little wood smoke and molasses taffy. The ending coats everything and leave a long and pleasant sourness. It is not often that I read scientific journals. But when I do, it is the latest issue of Neuropsychopharmacology. I thought this was a very unfair study, it targeted two associated things: men and drinking beer. Of course there will be an association. Now I am again rambling, let's hear the science. We drink beer for two reasons, or three if you have Untappd. The first reason is for the delicious flavours. The second is to trigger dopamine release from the striatum part of your brain. For those of you, like me, who slept through this class in school, dopamine is the classic reward neurotransmitter. Nicotine, cocaine and alcohol all have positive effects on the dopamine systems of the brain. You drink beer, alcohol causes release of dopamine and you feel good. Sounds right to me. That and a social media badge and life is good. Researchers at the University of Indiana set out to determine if just the flavour of beer could illicit a dopamine response without the alcohol component. On a side note, I think there are way more breweries in BC than Indiana. Indiana has about 20, BC about a whole lot more. Anyways, a bunch of right handed beer drinkers were hooked up to a fancy brain scan machine that could monitor dopamine activity in their striatum. Why right handed? Left handed people tend to respond to brain studies differently. But this is another article. Back on topic, these poor subjects were hooked up to yet another machine that sprayed stuff directly on their tongues. Oddly when water or Gatoraid was sprayed on the tongue, no dopamine release was noticed. However, when beer was sprayed on the tongue, or tasted, there was a noticeable dopamine release. Also of interest was that if there was a familiar risk of alcoholism, the dopamine release was increased. This study concluded that reward is a conditioned response that can be triggered by flavours and not the pharmacological effects of alcohol. Just tasting beer makes us want to drink more. Also if you have a genetic or family risk of alcoholism, your dopamine release is heightened. They should add another wing to this study to see if dopamine release is further enhanced when a new badge is gained on Untappd. Honestly these kids can do no wrong. Right on the heels of their Insubordinate session IPA, we have another tasty beer. 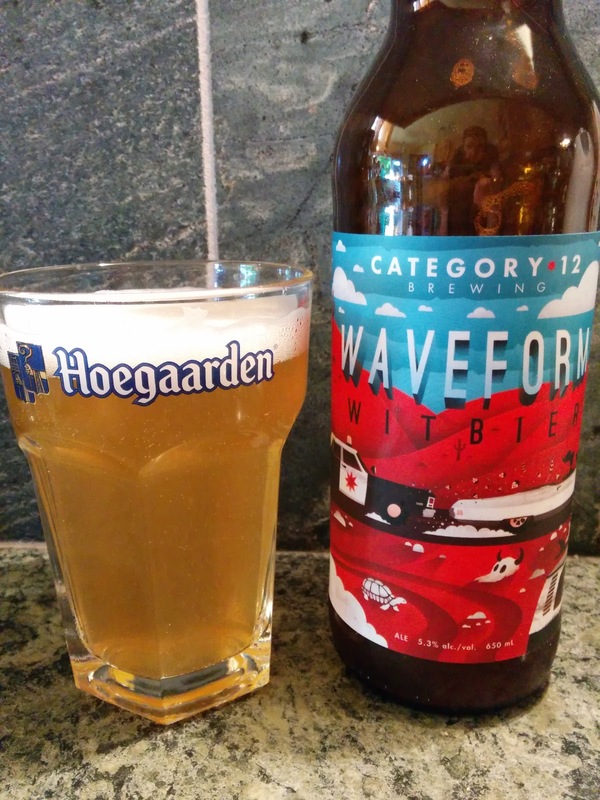 This time it is a truly summer release, a witbier. 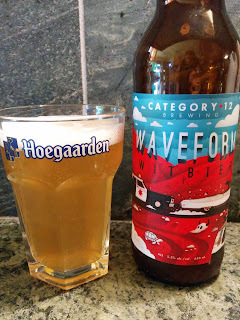 For those of you, like me, who are into beer styles a witbier ticks the BJCP 16A style box. I'm still going with the 2008 version. Most witbiers are clones or slight variants of the definitive style Hoegaarden. There are few things better than a fresh Hoegaarden on a warm day, no orange slice for me thank you. This style has a few essential flavour components. It should be sweet, but not excessive. There should be some tartness from the wheat malt and aromatic yeast. It should contain some subtle spiciness and citrus notes. The classic choices are coriander and orange peel. The Waveform hits most of these points, with a major twist. The Waveform starts off filling out most of the witbier checkboxes: aromatic wheat, vague spiciness and citrus. But very quickly things go awry. The wheat aroma and flavour is a little mushy, but this is easily overlooked. Do I taste fresh grapefruit flesh that is not hop derived? Who replaced coriander with warming cardamom? I need to reacquaint myself with this spice. Notes of brown bananas fills out the flavour package just nicely. A tasty twist of a classic style. 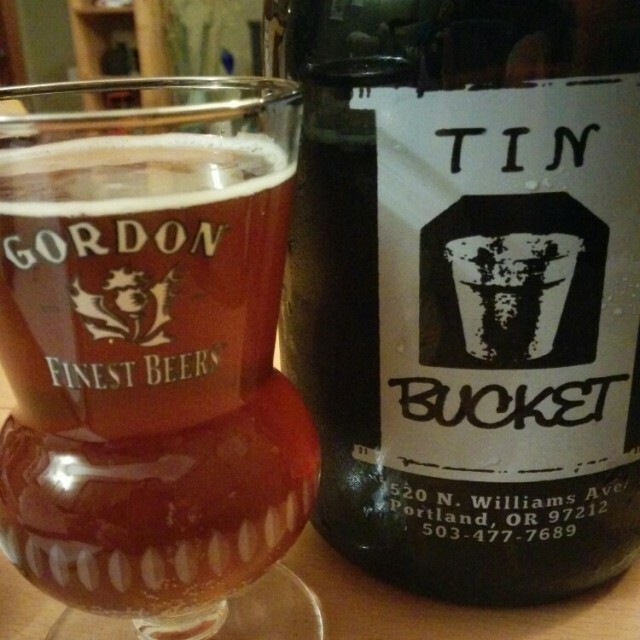 Glassware: A wit must be served in a heavy, hexagonal jam jar. So long as it is clean. If there is an orange slice floating in it, either fling it away or eat it. The only floaties I want in my beer are undissolved proteins or yeast flakes. Cellar: Only if your cellar is on the patio and it is removed once cold. 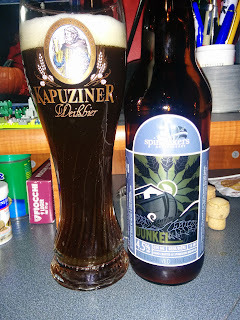 I am really far behind in my posts, this beer was released in January. The name eludes to the flavours and it also has a great label. Correct me if I am wrong, but is this the first Brett conditioned beer to be released in Victoria? 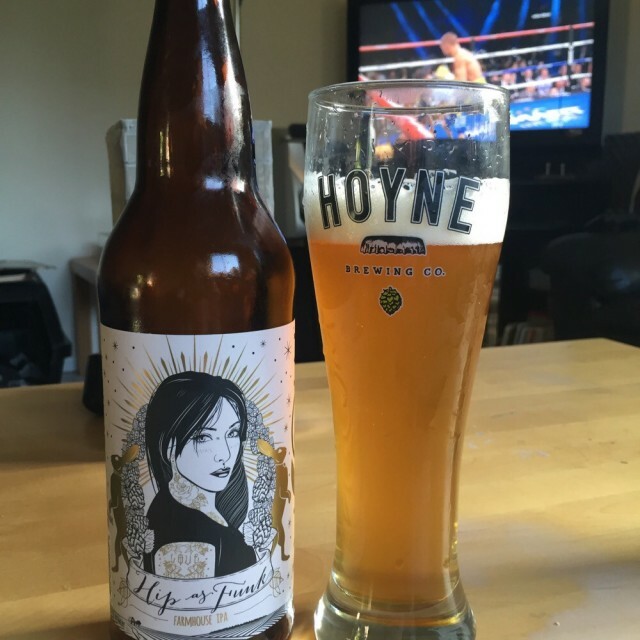 If so, props to Clay for releasing a brave new beer. If not, just props anyways for a great beer. The nose is all brett with nostril tingles of wood pile and wool gloves. It is a pleasantly tart and acrid sip that might be categorized as medium in body. To balance the tartness is a light pit fruit sweetness that encompasses apricots, dried pears, peaches and horse blanket. Sadly all these great flavours just end. 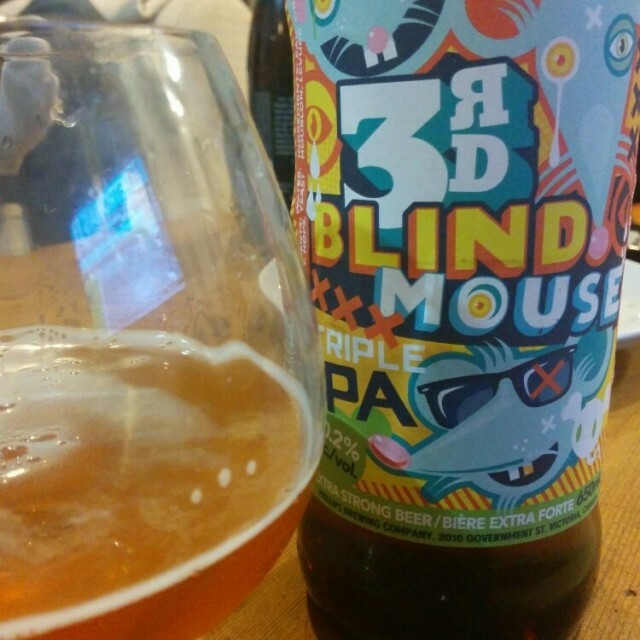 It is has an oddly clean ending for an initially funky beer. 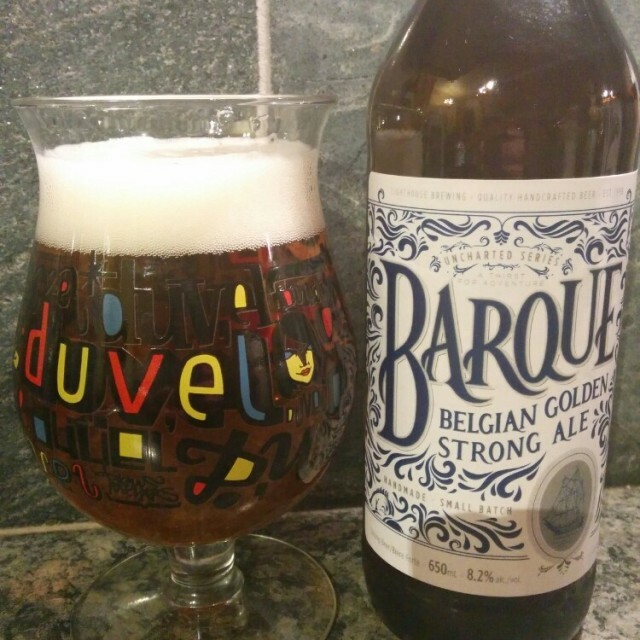 Glassware: I would prefer a tulip, but my buddy Brian has chosen a hefe style. Which is fine due to abundant head produced. 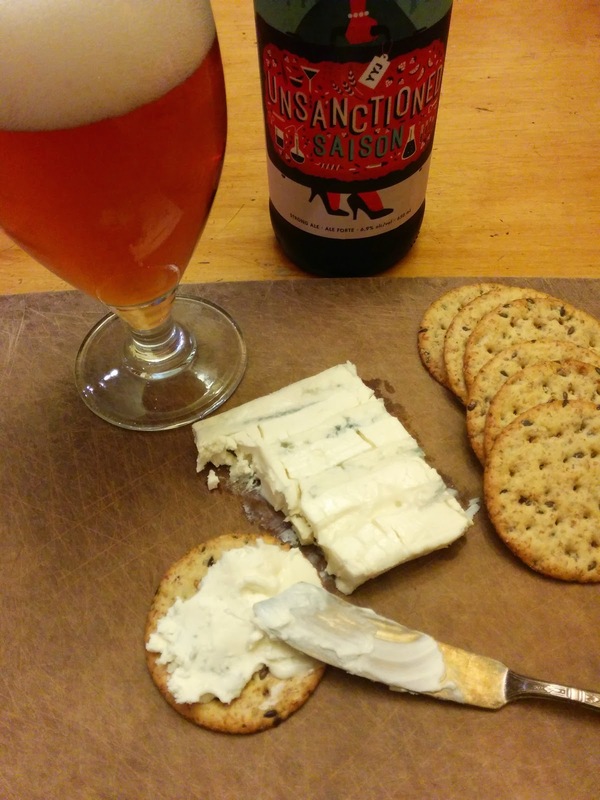 Food Pairings: Pairing with sour beers is a challange, but pick something on the light side. A good idea might be a grilled ham and a funky brie cheese. The high carbonation of dryness would work well to remove fatty or spicy tastes from the tongue; hello Pad Thai! A spicy sausage hoagie would be a good choice. Cellar: The brett yeast might produce some interesting changes with the residual sugar. Might be worth it. It is so nice to have a Cicerone working at a small, local brewery. That way, when they say that a beer is sessionable, it actually is. I suppose that this means Category 12 is almost a serious local brewery. In my selfish opinion I feel there are some informal criteria to meet to be considered a serious craft brewery. There are five of them, feel free to comment if you think I am crazy. First, you must produce a noteworthy IPA. A black IPA could be substituted perhaps. Almost everyone has one, some are better than others. Second, you must make a high gravity beer that is worth cellaring. This can be a barley wine, stout or a weird Belgian thing. Third, you must do a unique cask once a year. It cannot be a dry-hopped-something-you-already-have-on-tap. Fourth, you must make something session strength that is quaffable. Finally, you must brew something with a unique yeast or something sour. How many local breweries meet all of these criteria? Most of them do, or are well on their way to fulfilling these criteria. Well, this is rather opinionated of me. This never happens. Anyways I digress. This is the fifth release by the kids on Keating Cross. The previous releases were a pale ale and a Belgian dark. Both of which I tasted but forgot to review; I am such a slacker. The pale ale gets a 7 and the dark gets an 6. There was a weird aroma on the dark that threw me off. Still both were very tasty, I especially liked the pale. Lots of aroma and not too grassy. Again I digress, must be the lack of caffeine. This brew is darn tasty. An unexpected nose hits you with abundant pine/cedar and grapefruit citrus. The gripping bitterness followed the nose, yet faded quickly to reveal a mix of bready, biscuit and caramel malts. 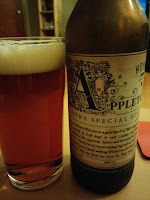 A simple, yet very drinkable beer, which is what a session ale should be. Oh and under 5%ABV. Glassware: What ever you have is fine. I did not include a photo of my glassware choice due to ummm technical difficulties. Food Pairings: A sharp cheddar would pair nicely, maybe even a Stilton. 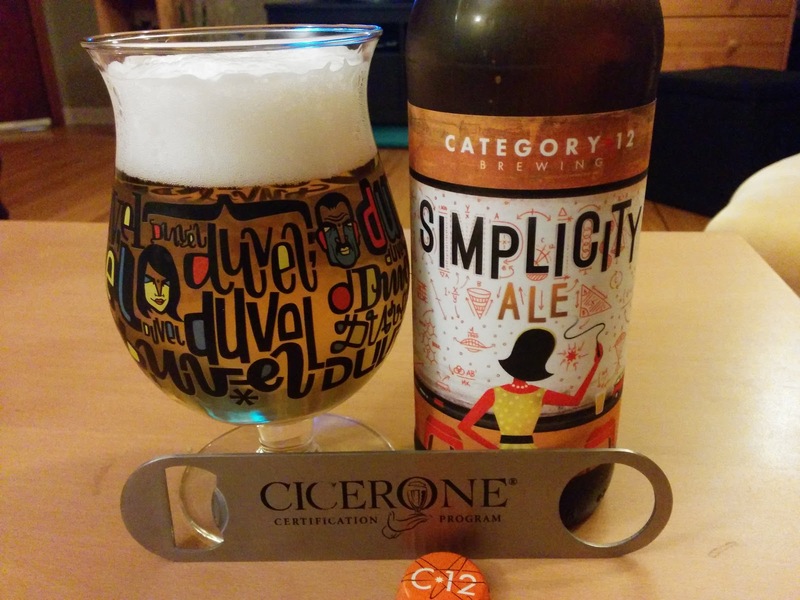 There is a bit of spiciness, pine and citrus going on in this beer. Would enhance a cedar grilled salmon nicely or contrast a sweeter pasta dish with some citrus component. Try with tuna lemon pasta. Just when you think a BC brewery can't find another obscure beer style. From Gose to Gratzer to Grisette. Essentially the grisette is a table (low alcohol) saison. It is meant to be an unobtrusive yet refreshing drinking beer. Rather like the mild ale to the English. Unsurprisingly Lighthouse put rhubarb in their version. I mean it tasted great in the Rhubie saison last summer. In case brewers are looking for more obscure beer styles, here is a list. Or here. Yup it works. A cereal/grainy nose carries familiar friends fruity tannic and lightly yeasty. This is quite a dry beer, partially from the high carbonation and tannic tingle from unsweetened rhubarb. 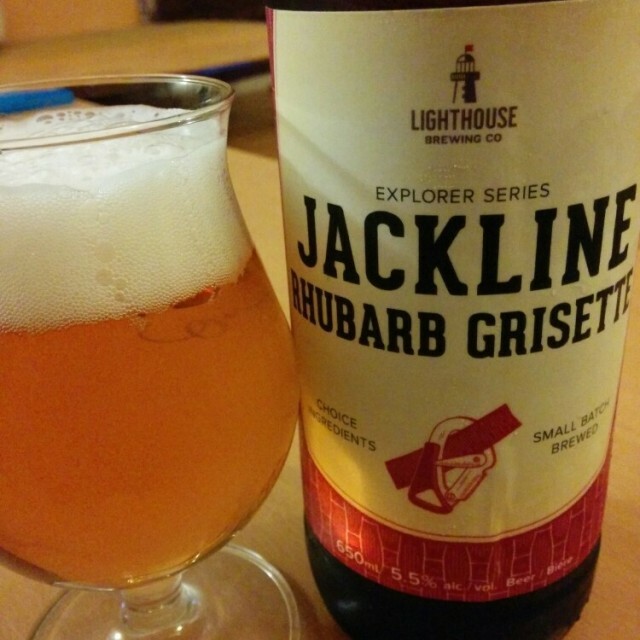 It is light and tartly refreshing with light cereal and lemon mixed with the namesake fruitiness. You will reach for another sip before the dry rhubarb quickly fades away. This beer is guaranteed to sell out this summer. Glassware: A tulip or pokal. Food Pairings: Seafood, definitely light seafood. Perhaps a shrimp salad with a lemon dressing. 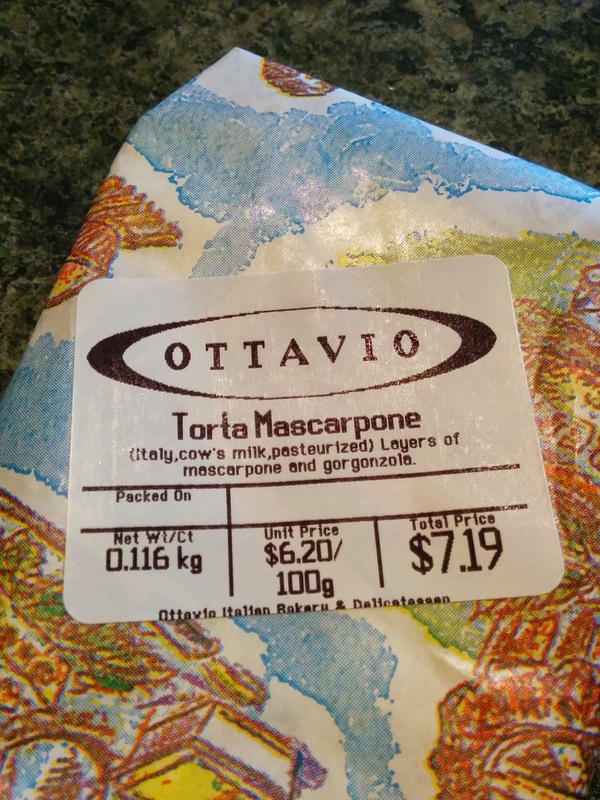 As for cheese the tartness with enhance a young goat cheese for sure. Perhaps I should elaborate or this will be a very short article. Researchers at the Griffith University in Queensland, Australia (where else), set out to answer this very question. Beer is apparently a very popular post exercise beverage, just as Olympic Gold Medalist Jon Montgomery. Could low alcohol beer with added sodium be an effective rehydration beverage? Actually, this is the second time these same researchers tried this stunt. Again, their old friend XXXX light (2.3%ABV) and XXXX Gold (3.5%ABV) got a dose of sodium and was served to some lucky, dehydrated university students. These poor students were stuck in heavy tract suits until they lost 2% of their body weight from sweating. Then they were given salty, low alcohol beer in approximate volumes to replace the fluid lost from exercise. Apparently the average fluid lost was about 2 litres, yuck. After this torment, the researchers learned that beer was not an effective rehydration beverage. Even though the saltiest light beer (2.3%ABV with 50 mmol/L sodium) was the most effective, it was also the least palatable. By comparison Gatorade contains about 20 mmol/L of sodium, so this beer was quite salty. I shall continue to sit on my couch and rehydrate with a nice Gose. Andrew was busy for Victoria Beer Week, which was a great time. He released two beers: the Master Blaster Brett Saison and the Black Cygnet session black IPA. These are on tap and growler releases only. No preamble just review. It is hard to go wrong with a fruity, spicy saison with the addition of brettanomyces. The nose was floral and tropical fruity from the hops and the brett character just dried that out and added a bit of funky orange peel. One can never have too much mango, dried pineapple or horse blanket. The Blaster was a little hoppy for a saison; I suppose the Northwest Style disclaimer in the name was enough of a warning. 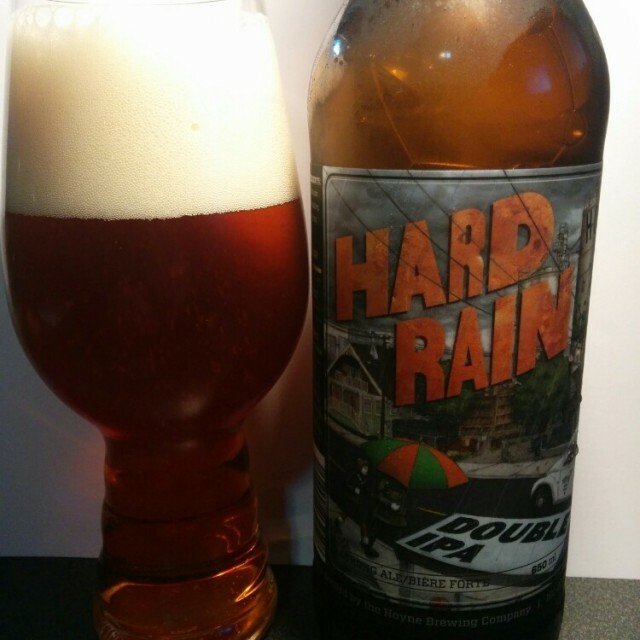 A spicy and tropical hop blast harmonized with the earthy and brett tart tang. There were some apricot and cracker malts along for the ride. It tasted a little thin but this was expected from the brett influence. The ending was short with cooling mangos. Very, very nice. Food Pairings: Breaded or poached light seafood with a fruity sauce. I would choose a wild mushroom and risotto with lemon drizzle. The cheese would have to be something fresh goat. 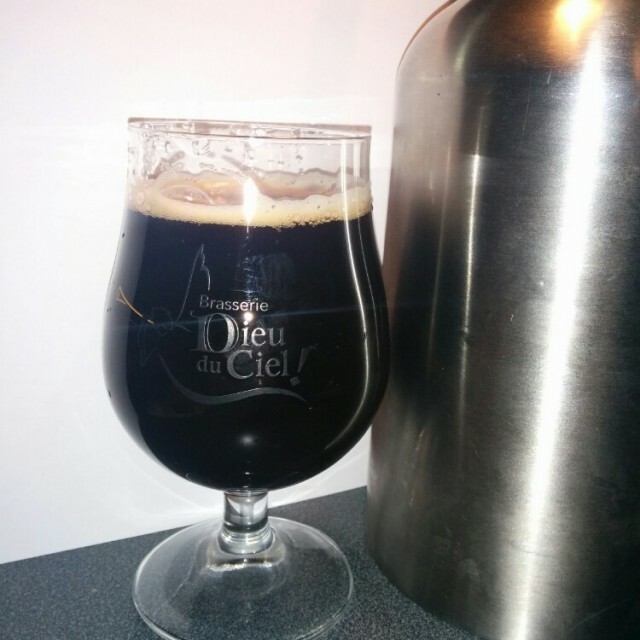 Cellar: Can you cellar a growler? 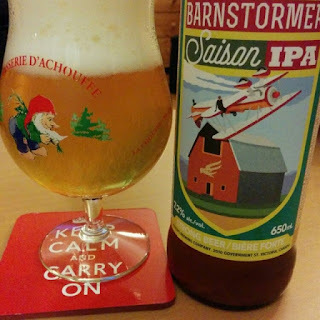 I really liked this beer, but I tend to like low ABV beers with lots of flavour. 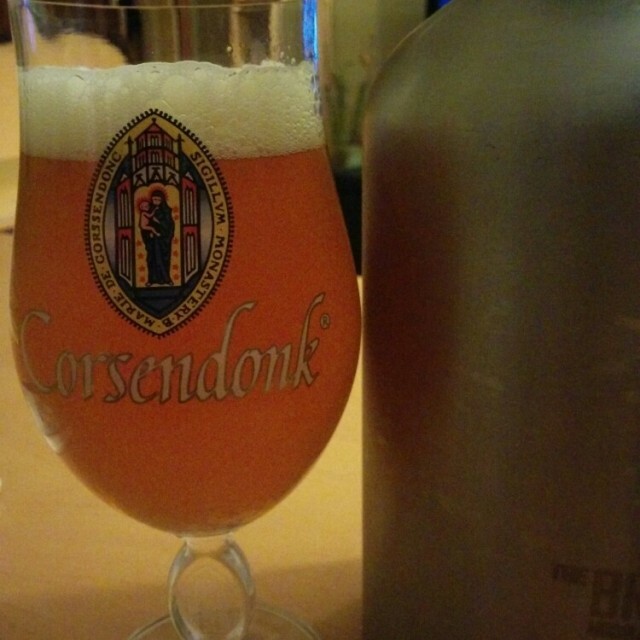 My growler still smells of powdered Nestle Quick and mixed citrus. The Cygnet was a very drinkable mix of weak coffee, dry chocolate, grapefruit, oranges and geraniums all in perfect balance. Food Pairings: Definitely something grilled and fatty. The cheese would be something cheddar and aged. Any excuse to buy a six pack of Keepers Stout is a good one. 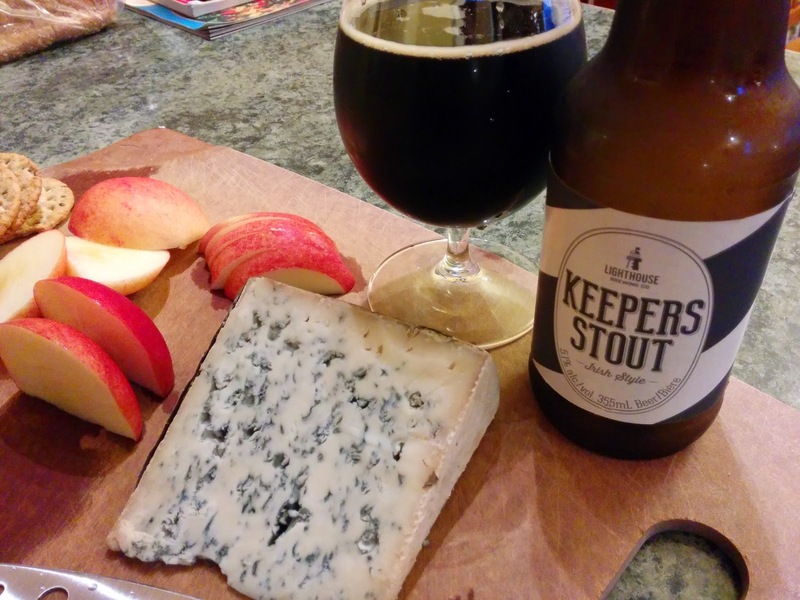 A dead easy beer and cheese pairing is blue and stout. This weeks choice was Cabrales blue from Spain. This Spanish cheese is a mix of raw cow, goat and sheep milk. It is aged in naturally occuring limestone caves for two to four months. In this moist envirmonment, the naturally occuring penicillium mold goes to work. 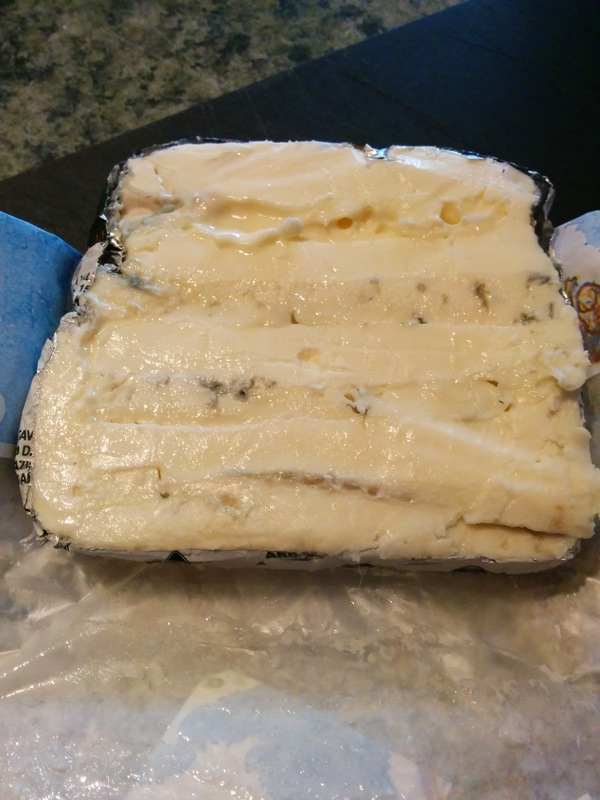 Unlike other blue cheeses, this mould is not injected into the cheese, but allowed to work naturally from the outside in. The result is a pungent aroma that is caracteristaclly blue. 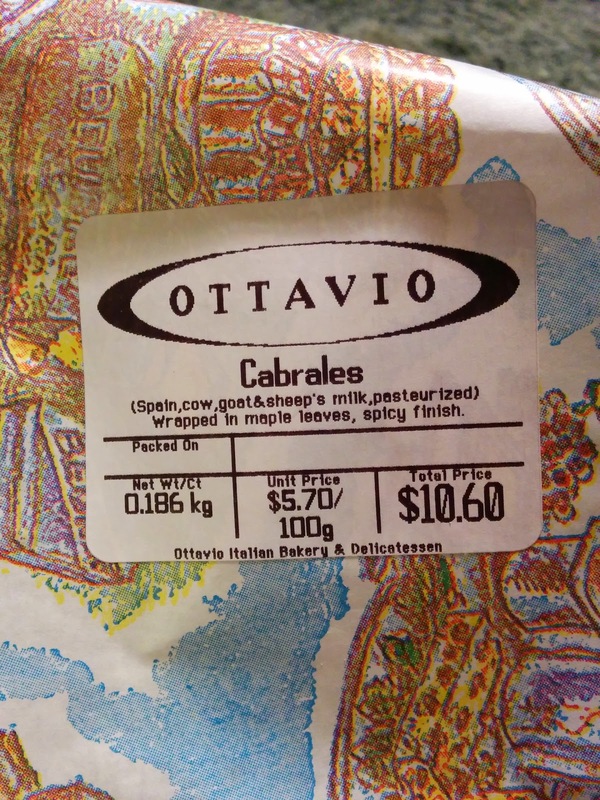 Cabrales is a creamy and crumbly cheese which can be somewhat spreadable. If you love that eye watering tart, funky and acidic blue flavours, then this is the cheese for you. When you add the dry and sweet flavours of an Irish stout, good things happen. The sweet flavours balanced the tart and sour notes of the blue cheese. While the dryness of the stout and bright carbonation worked to lift the heavy creaminess and fat off the tongue. This accentuated the richness of the 45% milk fat blue. A slice of sweet apple brought out more of this stouts chocolate sweetness. Yup, it's an easy pairing and I'm OK with that. meeting in 2012. In this study a handful of 21-30 year olds were paid $150 bucks to drink either beer or caffeinated beer, then their hangover score was determined in the morning. Apparently between 3-17% of students believe caffeinated prevent hangovers. I guess a slap to the back of the head is not scientific reasoning. So these lucky kids were given Hurricane High Gravity, with or without a whack of caffeine, until their blood alcohol hit 0.12 g% BrAC. In other words, nicely liquored on the cheap. DISCLOSURE: I have drank Hurricane before, but not in this quantity. My drinking buddies have this inside joke about drinking cheap gas station beer; but that is another story. So the result after waking up has no surprise. Over 60% of these lucky kids had hangovers. Shocking. Caffeine also had no affect on hangover severity. Despite the caffeinated beer delivering about 383mg caffeine, sleep onset and duration was not affected. Although these wired kids thought they slept better and were more alert in the morning. The researchers felt this study dispelled the misinformation that caffeinated alcoholic beverages prevented hangovers. I could have done the same with a bullhorn and a case of Redbull. I could be wrong but is the first draught only release by a non-brewpub brewery? Lighthouse has had experimental growler fills but has not made a big deal about them. Wouldn't it be great if this idea caught on. It might lead to more experimental brews, less packaging use and more Untappd check ins. Maybe the last one isn't so important. I have a great idea; how about if a local brewery sets up a 'pop-up' growler fill station at a local market. This is also selfish, as Moss Street market is only a few blocks from my house. I digress and dream. How did the Coffin Kicker taste? The nose was usual porter style: milk chocolate, roast, pencils and stale coffee. I happen to find the aroma of stale coffee appealing. It was an oddly creamy sip and not high in the roasted astringency department. This porter was straightforward and tied together roasted coffee beans, 33% cocoa mass and dark berries. One might think it was a little on the thin side, but I thought it increased quaffability. The finish added a little glycerin like coating. Overall a nice, simple and unflavoured porter. Glassware: Anything is fine, even the simple shaker. Food Pairings: You could draw in other roasted foods like BBQ burgers, steak or vegetable kabobs. In contrast use the roasted, dry character to balance out sweet and rich foods like brownies or mac and cheese. For a cheese pairing try a mild blue like Blue d'Auvergne or an aged cheddar.